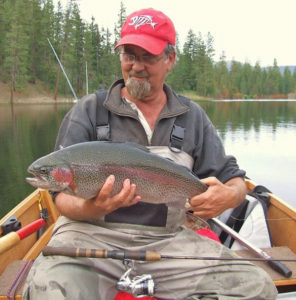 Why Use Rooster Tails For Early Season Trout? April means Opening Day for trout anglers. Lakes are starting to warm, trout are becoming active and anglers are there for this exciting time. Choices for taking trout are many: dough baits, spinners, spoons, plugs and good old worms and salmon eggs. All work. But none have the versatility, all around effectiveness and reputation as well known as the Rooster Tail spinner. Rooster Tails can be cast or trolled. Trolling is an excellent way to cover water and find aggressive trout. The flash of the Rooster Tail blade creates a greater attraction radius than most lures, bringing in more trout to strike. 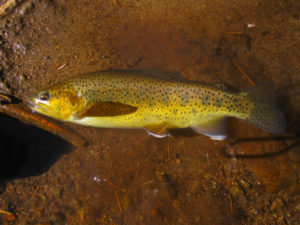 Early season trout frequently hang out in the first 10 feet of water, where it is warmest with the most feed. The weighted body of the Rooster Tail keeps the lure in the perfect depth while trolling, no need to add weight. When trolling Rooster Tails, try a thin diameter braid with a 6 foot section of 8 pound natural toned mono tied with a Uni knot at the end of the braid to the lure. Even at slow trolling speeds, you may see the vibration and blade spin easily on the rod tip due to the non stretch properties of braid. Rooster Tail blades are tuned to rotate even at the slowest trolling speeds. Favorite sizes and colors? Well, there are 10 sizes, 100 colors and 135 finishes to choose from. Try the 1/16th, 1/8th, 1/6th and ¼ ounce for the perfect balance of casting/trolling. For trout trolling and casting in lakes, here are some top choices that keep rising to the top of most effective: Red (R), red body/hackle/silver blade; Clown Coachdog (CLCD), olive/yellow/orange body/hackle/silver blade; Fire Tiger (FRT), yellow/olive/red body/hackle/brass blade; Frog (FR), green/olive body/hackle/brass blade; White (WH) white body/hackle/silver blade and Yellow (YL), yellow hackle/body/silver blade. My absolute favorite is the new Cheese Fly (CHFY), with an orange/yellow tail and body, brass blade. Last spring, more trophy sized rainbows, browns, brookies and especially cutthroat fell to that color combo than any other. Tipping is not just for good service in restaurants, it can be the difference in an interested trout follow into a vicious strike. A small 1 inch piece of nightcrawler or single salmon egg on the treble/single hook on a Rooster Tail makes a great lure unbeatable. No bait, no problem…spritz a pump of Rooster Tail Scent Spray on the lure. Rooster Tail Scent Spray is loaded with amino bite stimulants and UV to really pop visually as well as smell. Best of all the spray will not matte down the attractive movement of the hackle tail. Best flavors? In this order, but know that each one was flat deadly the last two seasons: Garlic Plus, Trophy Trout and the leader going into the clubhouse Trout Kokanee Magic. If trolling is not your thing, no problem. Rooster Tails can be cast easily on light line. Position yourself (boat or bank) near where trout may be found and fan cast your Rooster Tail, covering the area. Start your presentations near the surface, then with each “round” of casts, let the lure sink a few seconds more, until bottom is reached or strikes become consistent at a certain depth/area. Retrieve the Rooster Tail just fast enough for a 4 to 6 time “blade thump” per second. To ensure a good blade spin, retrieve the lure quickly at the beginning of the presentation until you feel the “thump” of the rotating blade. Reel ‘till you feel, as they say! Great sizes/weights for casting are the 1/8ths for shallower water/close to your position; the 1/6th for ideal all around size for distance and depth and the ¼ ounce for breezy conditions or when you have to get the lure down quicker. A great tip that needs to be put out there is Rooster Tails are not just for trolling or casting/retrieving, they can be jigged also. 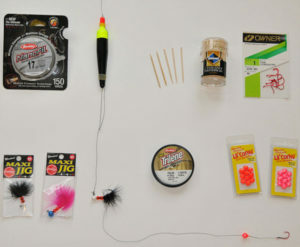 When trout get finicky- and if you spend any time on the water there is a guarantee there will be times when bites are hard to come by- try this trick. After casting and beginning your retrieve, sharply drop your rod tip approximately six inches, creating a nano second of slack line and allowing the Rooster Tail to drop a foot or so. Many salmonids (trout, salmon) key on falling prey, mimicking a wounded/dead/distressed creature of sorts. This swift, short dropping action can trigger an aggressive grab from a trout that may have been on the fence if it was to bite or not. This entry was posted in fishing basics, Fishing Tackle, Trout and Salmon on April 9, 2019 by ronniegarrison. Recently a fisherman contacted me at TPWD with a question about decontaminating waders and fishing gear—we appreciate your interest in protecting our natural resources for future generations! Any gear used in the water should be decontaminated before you use it on another water body or at another site on a river or creek, especially if you move upstream. For waders, we recommend that, at minimum, you remove any mud, plants, or other water and let them dry completely. Make sure to pay special attention to gravel guards, boot treads and use a flathead screwdriver or toothbrush followed by a wash-down of the gear with a good strong spray nozzle on a water hose. If you can, go the extra mile and decontaminate after cleaning and before drying. Here are three options to decontaminate your waders and nets—the first option will kill any disease-causing organisms (like whirling disease of fish). Be sure to wear eye protection and gloves, and protect your clothing. Best option: use a 10 bleach/water mixture—this can cause some waders to fade. Add ½ gallon of household bleach to a five-gallon bucket filled with water—make a new batch of bleach water every time you decontaminate. Put the waders and gear in a big Rubbermaid tub or mop sink, weight them down with something that won’t corrode, like bricks or rocks. Pour the mixture in and make sure everything is submerged. Set a timer for ten minutes—no less and no more than 12 (for your gear’s sake—10 min is the recommended time). Rinse the gear and let dry completely—hang waders upside down. Dump the bleach/water down the sink drain. If outside, dump the bleach water at least 300 yards from the nearest outdoor water source. Make a mix of half Formula 409 and half water—just enough to cover the waders in the tub. Pour the 409/water in and make sure everything is submerged. Soak for at least 10 minutes and try to agitate (just slosh the liquid in the tub around a bit). Best to dump the solution down the sink drain. Acceptable option: use hot water; for invasive species but not disease. Follow the same basic soaking/weighting procedures as above. Soak for at least 20 minutes in the hottest water your tap can provide—aiming for 120°F. Add hot water periodically during the 20 minutes if you think it’s needed to keep the water super-hot. Some other options—not the greatest—are to run waders through a very hot cycle in the washing machine or dishwasher and let dry. For other fishing gear, do the same thing—remove any mud and plants, rinse, and let dry completely. For dip nets or other nets that won’t be damaged, the extra decontamination steps described above are good practice—even though they won’t be good (or really necessary) for fishing rods. Here’s a link to a nice fly-fishing group website that I like because it gives good, clear information and a nice flow chart. Even though the group is in the Rocky Mountains area, the methods apply everywhere. Thanks again for your diligence to protect our waterways! This entry was posted in Conservation, Trout and Salmon on January 24, 2019 by ronniegarrison. Conservation is a long game, so it is especially important to celebrate successes. 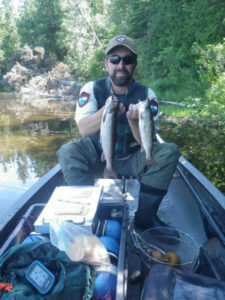 TU-supported science helped to identify the best places to target invasive lake trout. TU scientists are also helping to revolutionize the recovery of imperiled native trout species. 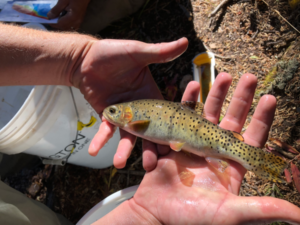 With support from NASA, TU worked with partners to develop a new spatial analysis that allows managers to determine extinction risks for Lahontan cutthroat trout. This tool could be a game-changer in helping move the conversation from stopping extinction of native trout to promoting recovery. As state and federal agency commitments to science decline, the investments of TU and our partners in fisheries science become ever more important. For example, our partners at the USGS Leetown Science Center discovered that almost all brook trout populations in the eastern U.S. have a unique genetic signature. In the Southeast, almost all populations are isolated from one another, with essentially no gene flow. 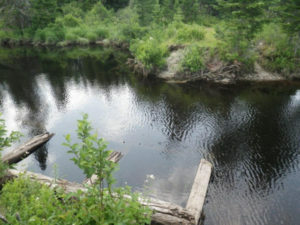 This makes the work of chapters and staff to remove obsolete dams and fix perched culverts more essential to the long-term health of brook trout and other wild and native trout. Recovering the natural resiliency of rivers and streams is a top priority in the face of increased floods, fires and drought associated with climate change. The Big Wood River in Idaho has suffered through devastating fires and a massive flood in recent years. TU worked with the local flood control district to reconstruct a major irrigation diversion that was blown out by the flood, and in so doing they recovered the river’s natural floodplain and made future irrigation on the river much less ecologically damaging. When volunteers and staff work together, magic happens. Consider the fact that advocacy efforts in Pennsylvania by TU staff and volunteers enabled us to secure wild trout status for 476 stream sections in the commonwealth totaling nearly 1,000 miles. The future of conservation depends on engaging more kids, and the future of Trout Unlimited lies in our ability to diversify the organization. STREAM Girls, a program TU developed in partnership with the Girl Scouts USA, helps us to accomplish both objectives. The program employs STEM-education (science, technology, engineering, math) plus recreation and arts to engage girls while exploring their local streams. STREAM Girls grew into new regions in the last year, and the curriculum expanded to include exciting new technologies and elements of citizen science. Not a lot happened in Congress in 2018, but a major win was reauthorization of the Farm Bill. This is a major bipartisan victory for private land conservation. Among other things, the Farm Bill cuts red tape to enable more and larger landscape-scale conservation; improves irrigation efficiency and watershed health; and funds restoration of small watersheds. To be certain, we have our challenges in 2019. Chief among them are improving a backward-looking proposal to remove the protections of the Clean Water Act for 20 percent of the nation’s streams and 50 percent of its wetlands; continue the fight to protect Bristol Bay from industrial-scale mining; and pass an Omnibus Public Lands Bill to fully fund the Land and Water Conservation Fund and pass the Frank and Jeanne Moore Wild Steelhead Sanctuary Act. Your work in thousands of communities across America to protect, reconnect and restore the lands and waters that sustain us are seeds of hope. Your efforts to help a veteran to heal through time on the water or to teach kids about the wonders of the Lord’s creation are seeds to a better future. Let’s get after it for 2019. Read more like this at www.tu.org. This entry was posted in Conservation, Trout and Salmon on January 22, 2019 by ronniegarrison. Farmer Urban Eberhart recalls watching a video of Middle Columbia River steelhead trying in vain a few years ago to jump a diversion dam blocking historic spawning grounds in the upper reaches of Central Washington’s Manastash Creek. Heavy equipment removing the Reed Diversion Dam in late 2016. 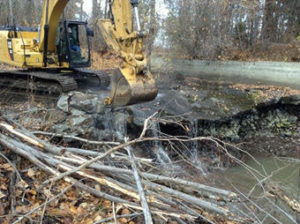 Now that diversion dam is gone, dismantled through the cooperative efforts of local irrigators, Kittitas County Conservation District, and the Yakima Basin Integrated Plan partners, Mid-Columbia steelhead, a threatened species under the Endangered Species Act (ESA), are now re-establishing themselves in more than 20 newly accessible miles of healthy creek habitat. 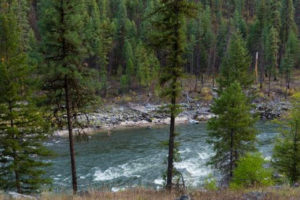 “The local collaboration that opened the upper reaches of the Manastash illustrates the kind of focused, coordinated efforts that federal agencies are now working to bring to bear on behalf of steelhead elsewhere in the mid-Columbia,” said Rosemary Furfey of NOAA Fisheries’ West Coast Region, chair of the Federal Caucus. The Federal Caucus is a coordinating organization of 10 federal agencies with roles in the recovery of ESA-listed salmon and steelhead in the Columbia River Basin. The Caucus is now working to support mid-Columbia steelhead through focused federal coordination that will improve the viability of the species and move it closer to recovery. 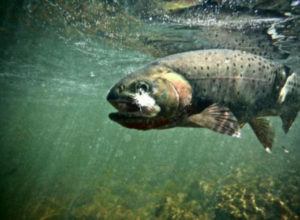 The agencies are coordinating efforts around mid-Columbia steelhead because it has shown progress over the last decade and may be approaching the point where it could be considered for removal from the list of threatened and endangered species. Much of this progress is a result of restoration efforts such as those on the Manastash. “This is one place where if we bring people together, and really coordinate efforts, we may be able to make a real difference for this species and demonstrate success in recovering a species,” Furfey said. 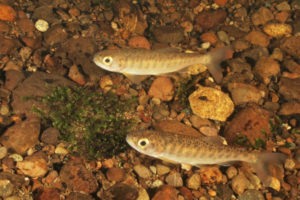 Federal agencies active in restoring the Manastash and recovering its steelhead populations include the Bureau of Reclamation, Bonneville Power Administration (BPA), U.S. Fish and Wildlife Service, and NOAA Fisheries. Manastash Creek reaches into the Okanogan-Wenatchee National Forest and stands out among tributaries of the Yakima River because much of its watershed remains undeveloped and in public ownership. 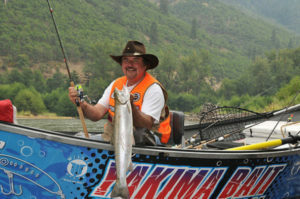 The Yakama Nation, Washington Department of Fish and Wildlife (WDFW), Kittitas County Conservation District, and Trout Unlimited have also played critical roles. Irrigators on the Manastash have worked almost since mid-Columbia steelhead were listed as threatened in 1999 to improve conditions for the fish. Although tension first prevailed as environmental groups threatened to go to court for better protection of the fish, a cooperative steering committee of irrigators, agency representatives, and other organizations began pursuing conservation improvements, such as screening of irrigation diversions that would support fish recovery while also maintaining farms and other agricultural operations across the watershed. Another example of progress is the Kittitas Reclamation District’s novel use of irrigation canals and ditches to deliver water to stretches of the Manastash and its tributaries that sometimes ran dry in low-water years like this one. Water conservation measures, such as lining of canals and installation of sprinkler systems, funded in large part by BPA, National Fish and Wildlife Foundation, Bureau of Reclamation, and Washington Department of Ecology have helped free up water that can remain in the streams to support fish. “Reclamation is pleased to be part of the team that has advanced Manastash Creek Enhancement Project which has produced such positive benefits for both steelhead, an ESA-listed species, and the agricultural community of Manastash Creek; and has made it possible to start the streamflow enhancement supplementation that KRD, Ecology, and Reclamation fully support for other creeks in the Kittitas Valley,” said Wendy Christensen, Yakima River Basin Water Enhancement Project Manager for the Bureau of Reclamation. Federal and state agencies have invested nearly $24 million in the Manastash Creek Restoration Project since 2003. While the collective price may seem steep, Tehan said that when agencies align efforts and leverage funding, success is more likely. For mid-Columbia steelhead, that has proven true. 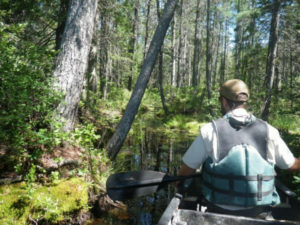 Biologists from the WDFW monitoring the streams with renewed water flows are finding a resurgence of streamside plants and aquatic insects that form the ecological building blocks of healthy fish habitat. As Eberhart recounts the story of cooperation and progress on the Manastash to others around the Columbia Basin, he has fielded more requests for advice and suggestions on how to undertake similar efforts elsewhere. As climate change puts added pressure on both agriculture and fish populations to make the most of limited water supplies, he said, such conservation and cooperation will become even more important. Yakima Basin Integrated Plan: Habitat and Agricultural Improvements, U.S. Bureau of Reclamation. Yakima Creeks Replenished: Yakima Integrated Plan saves steelhead habitat, U.S. Bureau of Reclamation. This entry was posted in Conservation, Trout and Salmon on January 5, 2019 by ronniegarrison. The first time you snorkel a stream, the size of the bugs are disarming. Stoneflies tumbling down the stream look like aquatic dragons bent on taking off a limb. It is an optical illusion, of course. And not just any steelhead but likely part of the fabled Idaho “B-run” steelhead that spawn primarily in the Salmon and Clearwater rivers. The B-run steelhead are Idaho’s largest, and with good reason, some climb more than 6,000 feet in elevation and traverse more than 800 miles to their natal mountain streams to spawn. Lower Granite is the last of the eight federal hydropower dams that span the Columbia and Snake Rivers. It is the last impediment to the several thousand miles of habitat – much of it five-star quality—that awaits salmon and steelhead in the Snake River Basin if they can get past the dams, and too few do. 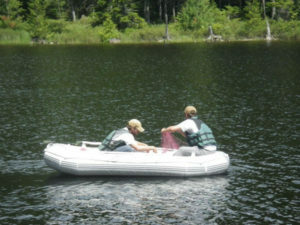 Read more on trout conservation at www.tu.org. This entry was posted in Trout and Salmon on December 14, 2018 by ronniegarrison.